Join Pittsburgh’s doers, makers, movers and shakers for a dance-fueled night of celebration. 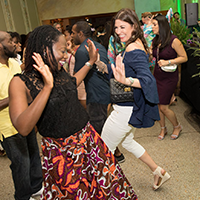 Dress up creative chic, put on your dancing shoes, and show us those new moves at Full Bloom, KST’s annual benefit bash and celebration of summer in the city. East Liberty heats up this June, inviting guest from all walks of life to join us on the KST main stage for live performances, food and drinks from the East End’s favorite bars and restaurants, plus a dance floor that’s no stranger to the best movers and shakers in the city. All proceeds support the Kelly Strayhorn Theater and summer programming series CELEBRATE EAST LIBERTY!